I wriggle into the skin-tight wet suit in a less than graceful manner, yanking and tugging the neoprene that’s suctioning to my body. I’m immediately hot, but the suit is a necessary measure for the 60-degree water that lies 80 feet down in Lake Jocassee. As I slip into my fins and position my face mask, Dee Lawrence, a jovial 50-something dive instructor, checks over my gear before helping me into an inflatable vest (a buoyancy compensator device or BCD), which is attached to an oxygen tank and regulator with three air hoses and a dive computer to remind me when it’s time to come back up. It’s a heavy, clunky getup. With a few awkward strides toward the front of the pontoon boat, taking care not to trip over my two-foot-long fins, I land in the water and am at once weightless and buoyant. Curtis Shoff, the owner of Asheville’s Bermuda Triangle dive shop and his brother, Eddie, are already in the water. 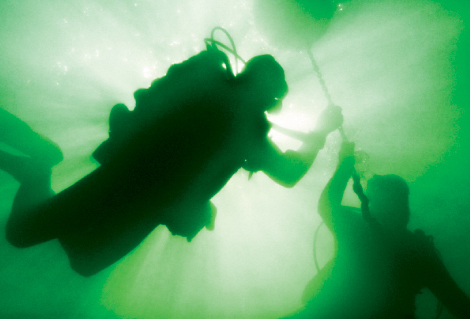 Curtis and his crew make weekly trips to Lake Jocassee—a 7,500-acre, 365-foot deep reservoir located on the border of North and South Carolina—to certify new scuba divers. But today’s trip is purely about exploratory fun. “I like to tell people this is Gatlinburg under water,” says Eddie, citing a mannequin on a toilet and a flock of plastic flamingos among the oddities that unnamed divers have placed in the depths of the lake. Though I dove at a shallow training site in Jocassee about eight years ago when I completed my scuba certification, I hadn’t been diving in freshwater since. Sea creatures and coral exploding with color on The Great Barrier Reef have wowed me beyond imagination. But now, having experienced numerous ocean dives over the years, I’m curious to see how lake diving compares. Tales of a man-made reef comprised of oddball trappings from the dry world piqued my interest, but the deal was sealed when I heard about the underwater graveyard. Jocassee was a deep valley before Duke Power Company flooded it to built a hydroelectric dam in 1973, choking the flow of the Horsepasture, Toxaway, Whitewater, and Thompson rivers. Communities here were either demolished or relocated, though a few structures remained, only to be swallowed as the lake filled. Because the body of water and surrounding land are now owned by Duke and South Carolina, the area remains undeveloped, but accessible to the public. Devils Fork State Park provides access for boaters and fishermen, but scuba divers represent the largest group who frequent the lake. Excluding spots in Florida, it’s arguably the most sought after freshwater diving locale on the East Coast because of its water quality (up to 20 feet of visibility) and sunken attractions. “I’ve been down here when there’s no place to park,” says Curtis, referring to a typical weekend on the lake. We’ve dropped anchor at a site called The Quarry—a 30-acre cove along the eastern shore and the blast zone created to build the dam. A sheer granite cliff towers about 100 feet above the surface and drops another 30 feet below, where, like giant stairs, a couple of 30- to 60-foot ledges and drops comprise an underwater playground for divers. On the ledges rests a basketball goal with a bowling ball, a motorcycle, and a suit of armor named Sir Divesalot. We came to see The Junk, a teak Chinese sailboat. The secret as to how it got here seems to have sunk with the ship. With all of our crew in the water, we begin our descent; expelling air from the BCD and letting the weights in our vest pockets slowly sink us. The emerald water darkens as we reach 65 feet. Because of a heavy rain the night before, the visibility is only about five feet, so my nerves are taut. What if some scaly lake creature, which grows larger as I begin to imagine it, tries to get me—or worse, I lose sight of the others? I stick close. The Junk emerges eerily almost out of nowhere. Though it’s 40 feet long with a 15-foot mast, we can’t see from bow to stern. As we circle the rotting shell, Curtis points out the signs and license plates left behind by fire and rescue squads from Georgia and the Carolinas that come here for dive training. Fish, including trout, bass, and bluegill, also have made this their playground, where they hide and hunt. Venturing into the boat’s interior, I spot a hokey plastic treasure chest undoubtedly left by another diver before exiting through the front window. Curtis motions for us to follow him over the wall. About 10 feet from The Junk is one of the vertical drops. As we swim over the ledge and into the abyss I’m reminded of a story Curtis told me about a diver who was overcome by nitrogen narcosis (an inhibited state of increased nitrogen levels in the blood), passed out, and fell 157 feet down the wall. His friend rescued him, but looking down into complete darkness, the thought was bone chilling. We descend another 20 feet, staying close to the rock wall but don’t linger for long. The temperature has dropped significantly and we’re all running low on air. So after about 30 minutes underwater, it’s time to ascend. The Quarry may be Jocassee’s amusement park, but some of the lake’s real treasures—remnants of life before the dam—lie deeper and are reserved for advanced divers. Perhaps no one knows the lake’s depths better than Bill Routh, owner of Off the Wall Dive Charters and Lake Jocassee Dive Shop in Salem, South Carolina. He’s been diving for more than 30 years and is credited with finding two of the lake’s treasures, the Attakulla Lodge and the stone gateway to the Jocassee Camp for Girls, both of which rest under more than 300 feet of water. Using topographical maps, sonar, and underwater cameras, he was able to locate the structures before he and a team of professional divers went down. He discovered the camp in 2002, but the lodge was more illusive. “It took us two and a half years to figure out that it wasn’t upright,” Routh explains. When the lake flooded, the lodge, which served as a hotel from 1904 until the 1950s, was lifted from its foundation to rest on its side. For safety reasons and preservation, the locations of the lodge and the camp remain a guarded secret. However, the whereabouts of another deep-water attraction are less restricted. The Mount Carmel Church graveyard, as seen in the 1972 film Deliverance, lies beneath about 140 feet of water—unfortunately, too deep for me to go. The church was moved and sits on a hillside near the lake, and most of the graves were exhumed and relocated, but numerous headstones remain below. Technical divers can get a glimpse of the graveyard, but everyone else will have to settle for the movie. At the close of the day, I decided to visit the church that evaded engulfment. I expected to find a rustic wooden structure, rescued for history and nostalgia, but what I discovered was a brick building that had been constructed in the 1950s. It dawned on me this find really wasn’t so surprising. The lake is less than 40 years old, and there are likely plenty of people alive today who remember life in Jocassee Valley. It’s disheartening, but progress is bittersweet. In this case, a pristine lake with an underwater playground for scuba divers definitely falls on the sweet side of the equation. You must be certified to scuba dive. $400 and takes two weekends to complete. Off the Wall offers chartered tours of Lake Jocassee to certified divers.